Successful projects this year range from solar panels for the Lismore CWA Rooms and air conditioning for Lismore’s Rochdale Theatre to disabled access and toilet facilities for the Lismore Scouts and rehabilitation of Hollingworth Creek. The community groups received grants between $500 and $10,000 while all 29 rural halls in the Local Government Area received $2000 toward insurance and maintenance costs, and those subject to general rates had them donated. Lismore Mayor Isaac Smith said over the years the Annual Community Grants Scheme had funded hundreds of small to medium community projects which have had far-reaching impacts across the community. “The spirit of the grants scheme is about funding projects or activities that enrich our community. Council understands that a small amount of money invested in the community can go a long way,” Isaac said. “For a small community group, a few thousand dollars might mean being able to run a really worthwhile project that directly benefits the community. In many cases, if these small programs were to stop, people would fall through the cracks and our society would be worse off. 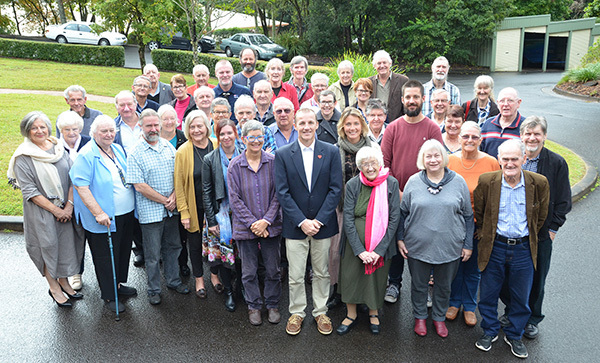 Image: Lismore Mayor Isaac Smith with the 2018 Annual Community Grants Scheme recipients.